Nursingpillow.com review: the NursingPillow.com promo code, is it a scam? Check out my personal research to learn more about this event! So if you haven’t noticed already, there are free promo codes for just about everything baby out there. You can get canopy covers for car seats, baby slings, and yes even a free nursing pillow. But what is the catch? The NursingPillow.com promo code, is it a scam? You’ll find out my personal research regarding this topic later in the article. But first, let’s see why nursing pillow is great for a breastfeeding mom. Why are breastfeeding pillows so great? Which breastfeeding pillow is the best? Do you have to buy a special breastfeeding pillow or will a regular pillow do? Pillows for breastfeeding are different than regular pillows because they are shaped to go around your waist area to provide support. There are a few different breastfeeding positions (especially the football hold) that having support around your side is very beneficial. Also, breastfeeding pillows are a little firmer than regular pillows so the foundation for support is better. Even if you are not planning on breastfeeding, pillows made for breastfeeding can make bottle feeding much more comfortable. There are two breastfeeding pillows that I have used and that I highly recommend. They are the Boppy and the My Brest Friend pillows for breastfeeding. Both pillows are different, but they provide excellent support. This is in my top five must-haves for a new baby (and in many other people's as well). I lived with this around my waist for the first 3-4 months of my daughter's life and even now I love it so much that it's coming with us as we fly home across the Pacific Ocean for the holidays. I even used this in the hospital right after my daughter was born and it helped so much when I was learning how to breastfeed. She was so very small and it kept her in a good position. It was also very easy to pack (in comparison with some of the other nursing pillows out there).Now that she's 5.5 months old, I'm still using it for breastfeeding, but it's come to have many more uses. She had some persistent minor reflux (and spit up A LOT), so this helped her to actually enjoy tummy time when propped under her chest and armpits. Also, she's now using it for support while sitting. On top of that, she has grown to absolutely love the pattern (she's always trying to "grab" the animals) and it's even been a pillow for me and my husband on occasion. It is nice lower back support for your rocker and I've even used it when sleeping on my side with my shoulder in the inner space while laying at the bottom of the bed, waiting for my daughter to go back to sleep in the middle of the night (her crib is at the foot of our bed).This has become a staple in our household for many reasons I could foresee, and a few I didn't expect. I highly recommend this pillow to all new moms. All the benefits of this pillow are wonderful and I've never wished I had a strap to hold it around me while my daughter nursed. This is a must have for breast feeing moms. My wife loves this pillow, it makes breast feeding our infant so much more comfortable. The shape fits perfectly around her waist and allows her to balance our daughter with ease for long marathon feeding sessions without too much discomfort. Breast feeding takes a ton of effort and time so any little thing that makes the task easier is worth the money in my book. The cover is washable which is great since it will eventually get messed up no matter how careful you may try to be. The animal prints are fun without being too busy so overall, I have no complaints. When I purchased this, I never in a million years expected to love it so much. It helped me after birth while sitting up, it helped me with breast feeding, and my daughter clearly (see pictures) loved it as much as her swing. The cover comes off for east clean up, and even the whole pillow itself is machine washable. It's soft, yet firm enough to support your baby, and it helped SO much with colic and her being gassy. A boppy pillow is ALWAYS a necessity with an infant, but a boppy with owls is even better!!! Before purchasing, I had so many questions about breastfeeding pillows and so I created this video to answer everything I wished I had known before, such as how does this compare to a Boppy? how does the Original My Brest Friend compare to the Deluxe? is the material comfortable? what are the features? I actually have all of these products now so, in my video, I compare them side by side, answer all of the questions above and more. Hope this helps someone else too. If this video review is helpful, please click on 'yes' below and happy shopping! My wife just came up with a solution to protect the foam tonight. First we removed the fabric cover. Then we just placed the custom plastic packaging over the foam insert. Now the fabric covering easily slips back over the plastic covered foam. Now when there is a spill you just have to wash the covering! I used the My Brest Friend pillow for the first 2 or 3 months because it was larger and firmer. After my babies got more head control, I switched over to the Boppy. When they became too big for that, which was probably around 6 months (only because I have a ridiculously short torso), I used the Boppy for everything else. There are other pillows for breastfeeding on the market such as the Nook Niche Pillow, which is all organic and will cost you $100 on Amazon. Another one, the Ergobaby Natural Curve Nursing Pillow will run you about $68 on Amazon. Each of these pillows has the same general purpose as the Boppy and the My Brest Friend breastfeeding pillows. They provide support all around you and make breastfeeding and nursing more comfortable for you and your new baby. These prices may vary depending on where you are located, but they are still crazy high. So how does this pillow compare to the other pillows for breastfeeding? This pillow is not the largest or the smallest breastfeeding pillow on the market. The Nursingpillow.com reviews all state that the products are not high quality and that they were much more pleased with the other breastfeeding pillows that they purchased. Although it is labeled “free” you are still spending money on shipping. The nursingpillow.com scam is not something that you should participate in or waste your money on! 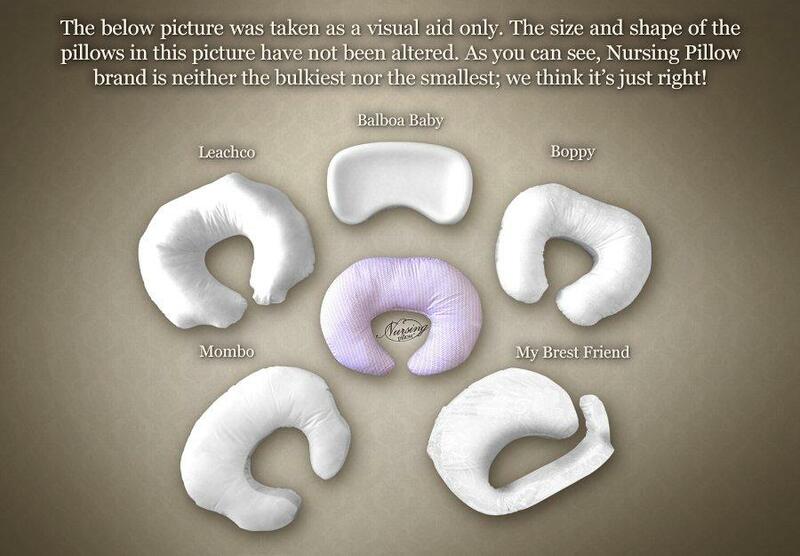 Below is an image that is taken from their website that shows how their breastfeeding pillow compares to other ones. As you can see the, nursingpillow.com reviews were correct about the shape and size of the pillow. Parenting: How do I know if my baby has colic? I hope you will find the breastfeeding pillow (or pillows!) that is best for you and your new baby. Like most other products out there, make sure you do your research and find out how you can get the most bang for your buck. I hope reading this helps you and you have a wonderful experience breastfeeding (or bottle feeding) your bundle of joy!